Hiya guys! How's it going today? It's been a few days and I know it's not like me to not post everyday. After a new brain disorder diagnosis, I was prescribed some medication that ended up doing more harm than good. I'm okay now after having had a few days to sleep away the side-effects and figure out issues with my blog. I've definitely missed posting and now it's time to play catch up and share more beautiful polishes with you all. 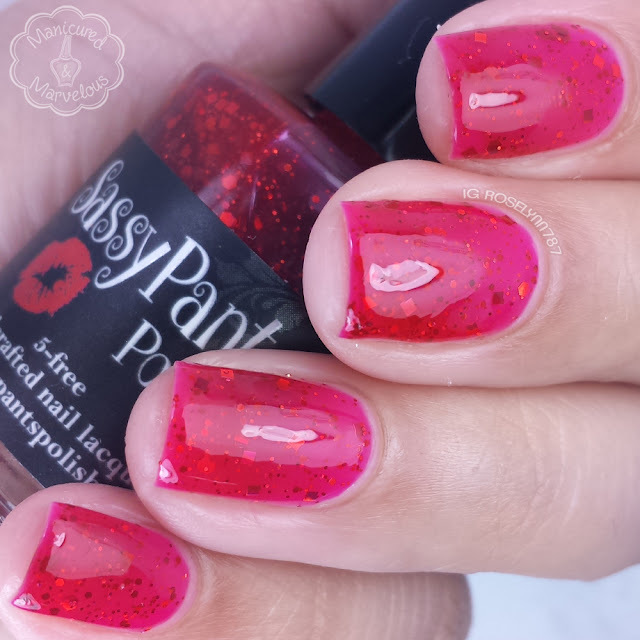 Today I'm sharing the adorable Wizard of Oz inspired Holiday collection from Sassy Pants Polish. This is a seven-piece set with all but one consisting of sparkling glitters. 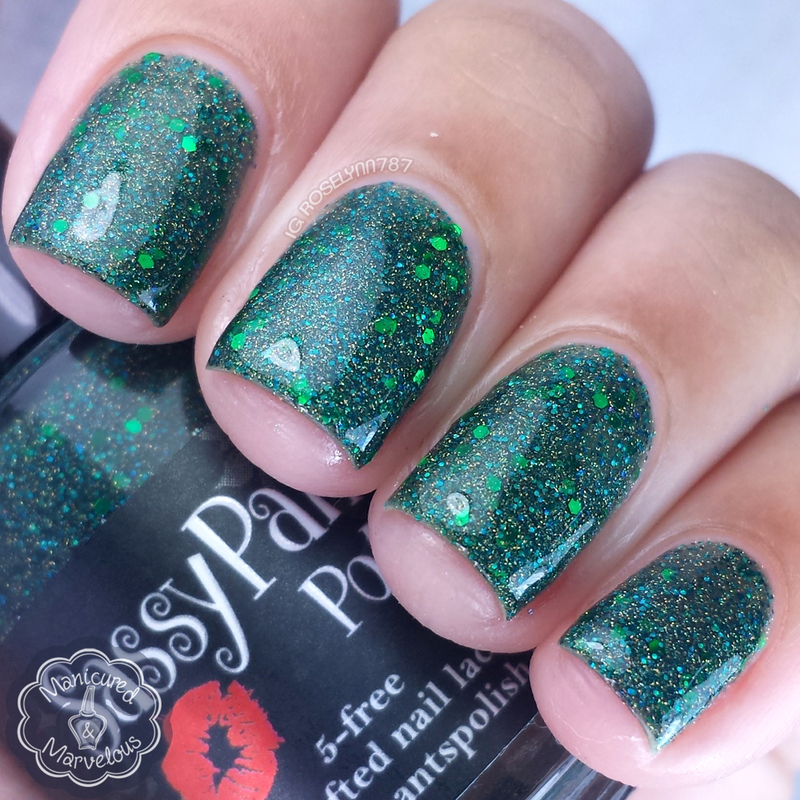 The Wizard of Oz Holiday 2015 Collection from Sassy Pants Polish is now available for purchase. Each polish retails for $10.00 for a full-size and there is a mini-size option for $6.00. There is also an option to purchase the collection as a whole, full-size for $60.00 and mini-size for $39.00. Yellow Brick Road can be described as a holographic gold base packed with various sizes of gold holographic hex glitter. Tis the season to be blinged out in gold! There is literally no excuse not to have a beautiful gold glitter polish in your arsenal. This is a full-coverage glitter on its own, but could also be worn over a base color. Formula is smooth and the opacity builds up pretty evenly throughout. Shown here is two coats and sealed with glossy topcoat. Tin Man can be described as a metallic silver with a subtle shimmer. This is actually the only non-glitter polish in the entire collection! Now I'm not a huge fan of the metallic finish, but I can definitely appreciate how spot-on the inspiration is. The finish is definitely non-forgiving to brush strokes and nicks. Formula is a bit on the thin side, but the consistency is nicely opaque. Shown here is two coats and sealed with glossy topcoat. 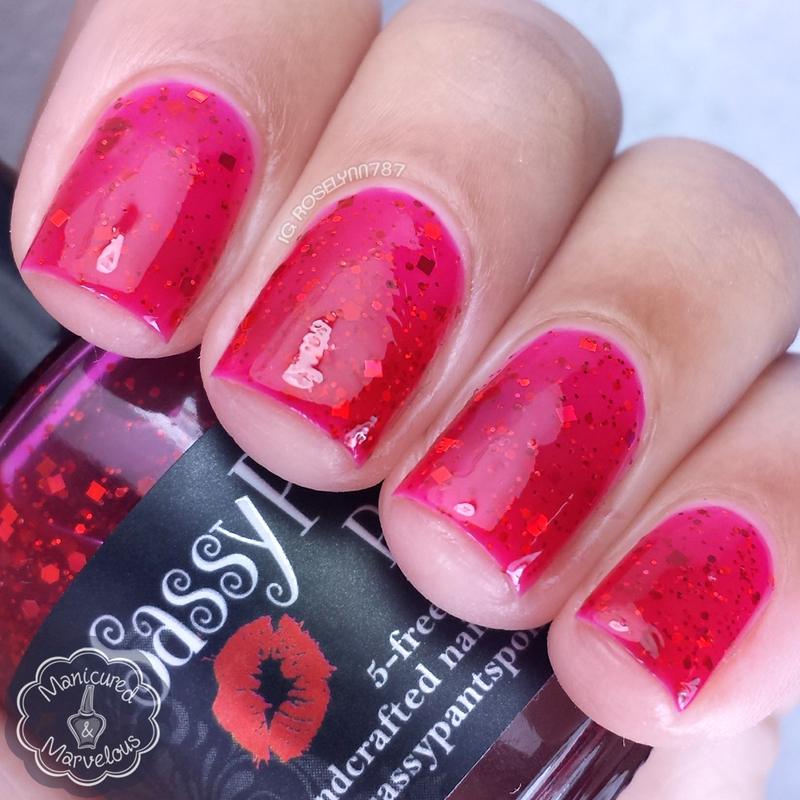 Ruby Slippers can be described as a red jelly base featuring red holographic hex and square glitters. This is a gorgeous red jelly and like the gold in this collection, this is definitely a must for the holiday season. Or just a must in any well rounded polish collection. I adore everything about a squishy jelly like this. Good formula, sheer as expected for a jelly but it does even out well. Shown here is three coats and sealed with glossy topcoat. 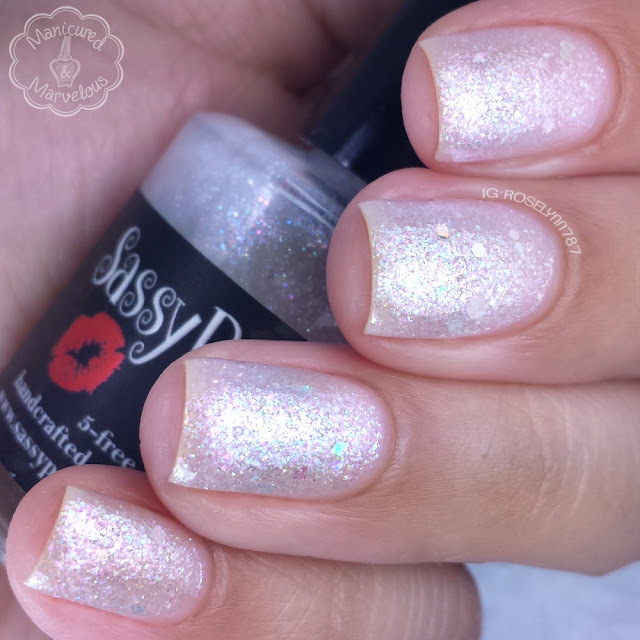 Good Witch can be described as opalescent glitter topper with various sizes and shapes of white/opal glitters. Although it was not the inspiration to me this absolutely screams snow and icicles! Normally I shy away from using polishes like this without a base color, but this one was so irresistible. Of course, you can also opt to use any base and simply use this as a topper as well. Formula allows for easy layering on its own and builds up evenly. If layering over a base color, only one coat would be needed for ample opalescent glitters. Shown here is three coats and sealed with glossy topcoat. Emerald City can be described as an emerald green jelly base with gold and green micro-glitter pigment and emerald holo hex glitter. 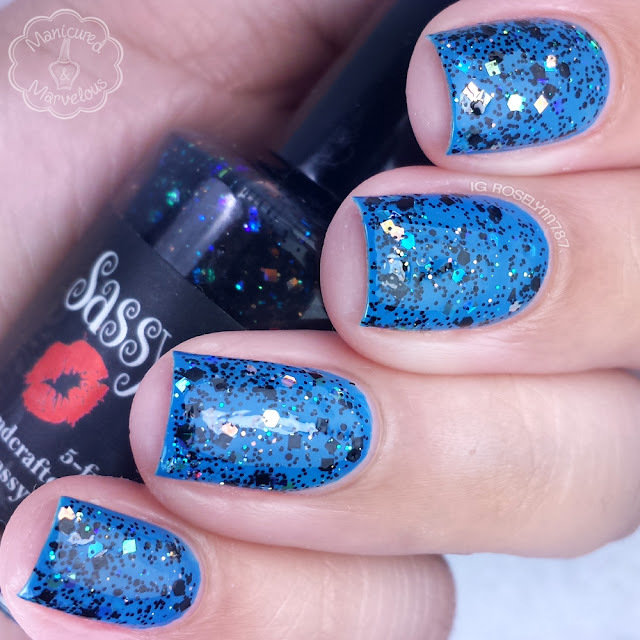 This gorgeous shade is so overly packed with glitters! It ends up working beautifully on it's own or layered over a base for less coats. Formula was great, not too thick or too thin. The finish is a little bit on the gritty side because of all the glitters so I would suggest doubling up on the topcoat. Shown here is three coats and sealed with glossy topcoat. Dorothy can be described as a pale blue base crelly with a multitude of different sizes and colors of silver and blue glitters. Must-have alert! This is such a gorgeous crelly for the winter season (or any-time really) and I am in love with it. Definitely my top-pick from this collection. The formula is much more opaque than I thought it was going to be and layers on very smoothly. Plenty of glitters in each coat and no need to fish for the larger hexes. Shown here is two coats and sealed with glossy topcoat. 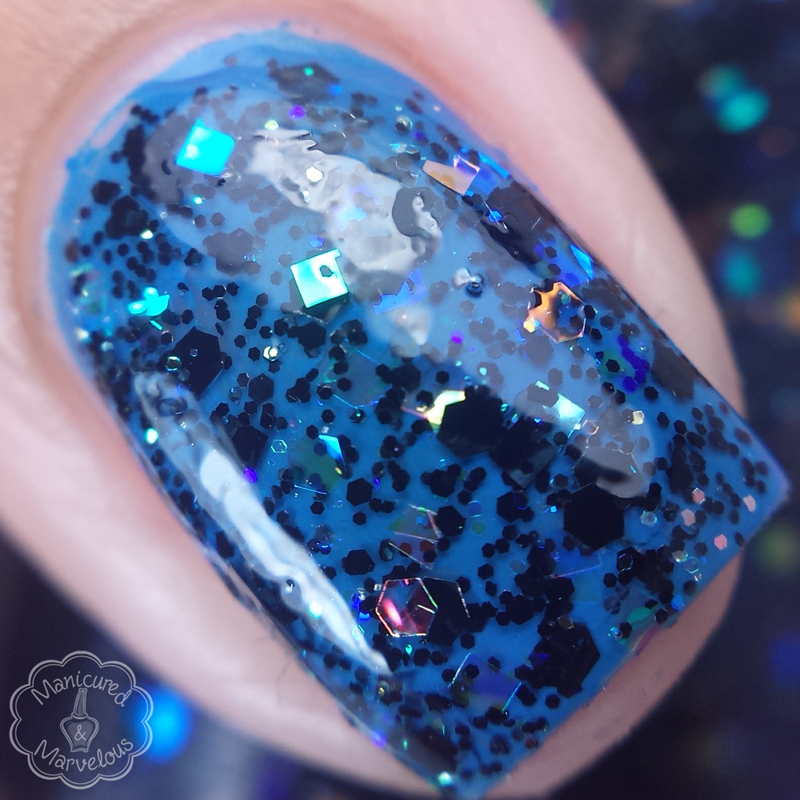 Bad Witch can be described as a clear base glitter topper with black micro glitter as well as black and opal hex glitter. I absolutely love glitter toppers such as this one because it looks so great no matter what base you use. The formula is really great and has so much glitter in one brush stroke. There is no need to use the dab method of application and there is no need to fish for any of the glitter choices. I felt like I almost didn't need the second coat and could of got away with just using one. Shown here is two coats over a blue base and sealed with glossy topcoat. 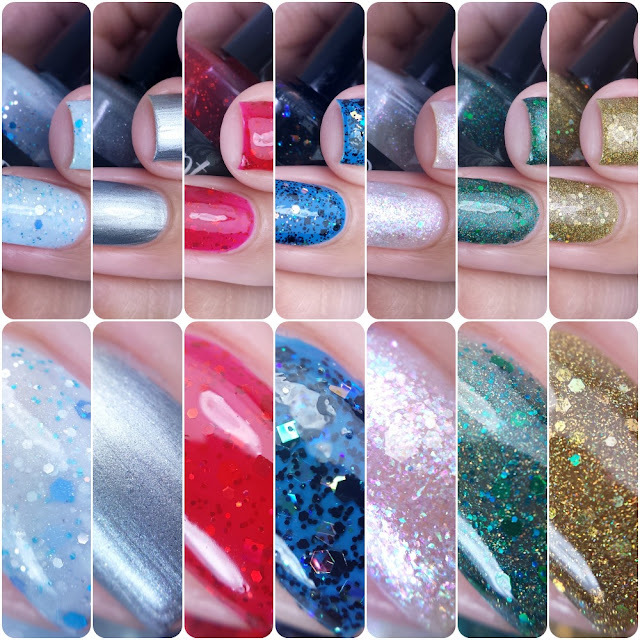 Overall I am impressed with new indie Sassy Pants Polish and their second collection. I love the Wizard of Oz inspiration behind the collection and the way it tied into the holiday, very clever and cute. I'm personally very intrigued to see more crelly polishes and glitter toppers in their future because the formula on those were on point! I definitely recommend Dorothy and Bad Witch hands down I think you guys will love these as much as I do. Tell me guys, which one is your favorite from this holiday collection? Dorothy is cute! I don't think I've ever seen a Wizard of Oz collection before. I dont think I can pick a favorite. Such a beautiful collection! I need Yellow Brick Road and Dorothy! I'm in love with Ruby Slippers and Emerald City! I don't think I could pull off Dorothy with my skintone, but it is quite lovely as well. Good Witch is just tops! Lovely! Good Witch is so icy and wonderful! Beautiful collection and swatches! I hope you're doing better hon! This is a really great collection! And your swatches are beautiful! Hope you're feeling better! I really love the golden and green glitters! Hope you're feeling better!